See below in Orange for recent enhancements! Make your tracker your own! Show as little or as much as you want! You are in control of so many options to make it look how you want! More than 50 options !!! Compatible with CraftStore Fixed and Bandits UI! Show more than one quest ! You can decide how many quests you want to display. Box fully modifiable ! Choose your Titles and Texts Fonts, Colors, Overall Background Color and Transparency through a dedicated menu, adjust your box to the desired position and size ! Sort Quests by Focused+Zone+Name or Zone+Name, if displaying zones is disabled then sorts will change to Focused+Name or just Name. Have a quests listed by name or zone and name, two different zone views. Use Keybinds to change your view on the fly! Quest Step Icons - Default is Off - Icon size will adjust to text size. Note if you have any issues seeing Icons, log out to desktop and back in. 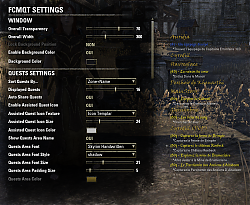 Quest Options Menu - Need to assign this in mouse settings to a mouse button. This option is a drop down, choices are "Disabled", "Focused Quest", "Focused Zone"
"Disabled" will display all objectives and hints, other filters in settings will be applied. "Focused Quest" will display objectives and hints ONLY for the focused quest, other quests will just list quest name. "Focused Zone" will display objectives and hints for all quests in the same zone or category of the focused quest. NOTE: Upon first upgrade of to version 1.5 this option is set to "Disabled", so you may need to update it to your preference. When enabled zones/categories will be filterd (collasped) except zone/category of focused quest. Collapsed zones/categories can be clicked on to view quests within it. Clicking and expanded zone will collapse it. Using the mouse to select a quest to focus will collapse all other zones/categories. Collapse all zones/categories except focused. Right clicking the expanded zone/category will collapse all zones/categories except focused. All filter options "Objective/Hints Settings" will apply to the viewable quests. Currently using the default "T" key, clicking on map icon, or using Journal will not collapse other zones automaitcally. Collapse All Zones/Categories - Collapse all zones excelpt focused zone. Expand All Zones/Categories - Expand all zones to see all quests. Auto Hide Zones/Category On/Off - Turn on or off the Auto Hide Zones feature. Change Zone/Category View - Change between Zone View and Category View. Hide Hint and Hidden Hint On/Off - Turn Hints and Hidden Hints on or off for all quests. Download - Use Minion it makes it far easier, then skip to step 3. Go to "Settings" -> "Addons" -> "FCMQT settings" and set the window width, position your window where you want. Lock the position to enable mouse interactions. Improve Chat Output, tracker messages and quest info. Show an update window at the initial load of a new release, to see items changed. Look into options to get more control over the default change quest key. Look into options to control what quest gets selected when a quest is completed. Restructure Language output to more efficient system. Fix for Locked Quest Bug. Add additional sort options and presets. I am currently working on a final solution for this. It appears this bug has been present since the beginning of the Add On. I will be working to finally get this one resolved. Technically not a bug, as there is little that can be done about it. When using this feature you may notice that your quests will not appear. This happens because you are in a location that is another zone or a sub zone of where the quest says it should be. Dungeons it happens a lot in. Nothing can be done about this at this time. Example Brass Fortress, the quest's zone ID is not the same as the zone. This means you may be in the zone for the quest but it will not show. Working for a resolution, redoing the way it treats zones. - Blackstorm for all his hard work. - Thanks to the ESOUI Addon Dev Community - They really are a great bunch of people. If you do not use Awesome Guild Store, this update is not necessary. -- Updated Manifest with new AddOnVersion variable. This is a maintenance release for support for Murkmire. Currently the 1.6 version is under development and should be released shortly after Murkmire goes live. -- Updated libCustomTitles to newest version, to fix any issues with RUEso. -- Added choice to display Icons or Text indicators for quest steps/conditions. -- Revamp option "Hide Objectives/Hints EXCEPT when focused" is replaced with "Hide Objectives/hints EXCEPT". See Below. -- Added when tracker is not locked, on initial load of addon it will give a message on screen. -- Added Custom Titles library, see below. -- Added chat message to keybind Toggles to indicate what the new state is. -- Changed that you cannot filter/collapse the zone with the focused quest. -- Fixed condition that setting to apply transparancy to quests not in the focued zone. -- Created base code for chat output for future release. -- Note if you have any issues seeing Icons, log out to desktop and back in. -- This option is a drop down, choices are "Disabled", "Focused Quest", "Focused Zone"
-- "Disabled" will display all objectives and hints, other filters in settings will be applied. -- "Focused Quest" will display objectives and hints ONLY for the focused quest, other quests will just list quest name. -- "Focused Zone" will display objectives and hints for all quests in the same zone or category of the focused quest. -- NOTE: Upon first upgrade of to version 1.5 this option is set to "Disabled", so you may need to update it to your preference. -- When enabled zones/categories will be filterd (collasped) except zone/category of focused quest. -- Collasped zones/categories can be clicked on to view quests within it. -- Clicking and expanded zone will collapse it. -- Using the mouse to select a quest to focus will collapse all other zones/categories. -- colllapse all zones/categories except focused. -- Right clicking the expanded zone/category will collapse all zones/categories except focused. -- All filter options "Objective/Hints Settings" will apply to the viewable quests. -- Currently using the default "T" key, clicking on map icon, or using Journal will not collapse other zones automaitcally. -- Collapse All Zones/Categories - Collapse all zones excelpt focused zone. -- Expand All Zones/Categories - Expand all zones to see all quests. -- Auto Hide Zones/Category On/Off - Turn on or off the Auto Hide Zones feature. -- Change Zone/Category View - Change between Zone View and Category View. -- Hide Hint and Hidden Hint On/Off - Turn Hints and Hidden Hints on or off for all quests. -- Improve Chat Output, tracker messages and quest info. -- Show an update window at the initial load of a new release, to see items changed. -- Look into options to get more control over the default change quest key. -- Look into options to control what quest gets selected when a quest is completed. -- Restructure Language output to more efficient system. -- Fix for Locked Quest Bug. -- Fixed intermitent issue with Quest Conditions not updating. I apolgoize for another update on the heels of one yesterday, but I was finally able to duplicate an instance where a quest did not update quest conditions count, that has been reported. It is resolved. Please remember if you find a problem, no matter how minor give me any details you can. Especially the Quest, it will make diagnosing the issue much easier. In this case it was not every quest, but once I found one it failed it I was able to find the root cause. Again, I wish I had found this sooner so I would not do another update right now. -- Moved "Or" items to Objective, using the symbols of "+ " but of the objective color. -- Changed labels on Quest Steps. I apologize, the game actually has it "Or" items labeled as objectives, I put them under a different category so they would stand out more in the tracker. I did not take into account that some people could be hiding hidden, hints, or optional items. I also discovered because of feedback from users, that the "Or" items are not only used when you have a choice of which NPC to talk to for example, it can also be used when you have a choice of where to go to complete this, or there are multiple locations and yo may only have to go to some of them not all of them. So I moved these items back to being a Objective, but instead of being proceeded by a "*?" it is proceeded by a "+". For example in the Madness in Shadowfen quest at the end you are to speak with Alvur Baren, it is showing up as he is actually in multiple location, you can actually turn the quest in at three different locations, as he is in Mages Guild in Elden Root, Wayrest, and Mournhold. This is not limited to just quest turn ins but also cases where you have multiple locations but only have to get one or a few but not all locations. I still want to mark this quest as something different especially when you do have the original intent of a choice between two people. So these quests steps will now be proceeded with a "+", indicating you do have choices. If actual independent choices show up, you only will need to complete one. If only one step shows as a "+" then you have a choice where to obtain that objective. -- Added display of "OR" quest items for when you have multiple possible objectives but only need to complete 1. -- Optional quest notes or optional objectives will be preceeded by "**" and of the optional color. -- Added option to hide tracker in combat - Keybind to hide tracker will override this. "OR" display of quests os for quests where you have more than one objective, but only need to complete one. For example you need to speak to one of two people. These will show under the "Optional Objectives" The color will be the optional color, and the quest condition will be lead by two "*". Once you complete one of the them, it will update to the next phase of the quest. For Example, *? Talk to Skorvild, the "**" indicats it is "Or" quest stage. New option to hide tracker in combat will be overriden by the keybind. That is, if you already selected the keybind to hide the tracker it will not become visibile again until you press the keybind again. Did this so that the game is making it visible when you want it to be. I found many issues with the tracker hiding, cleaned up the code and it appears to be functioning correctly. It should hide when the side menu is opened, the top menu is opened, in any of the character views, when any of the crafting windows are open, including CraftStore crafting windows. If there is any issues please let me know. -- Fixed two registrations of same event. -- Forced Quest Timer to hide upon completion of quest. This should fix the intermitent problem of not able to choose a quest. -- Fixed feature to hide zone with mouse click. -- Fixed Keybinds that would save it's toggle state to the SavedVars. -- Added slash command and keybind to Toggle lock for quest tracker "/fcmqt_lock"
-- Other miscellaneous performance fixes. * Note if you use the focused sort, any quest in a category will appear at the top as well. For example if you have 5 guild quests, and one in the zone you are in. In Category view it will place the one quild quest at the top under the heading of Guild. Further down the list you will see Guild listed again, with the remaing 4 Guild quests. *** The feature to move the tracker will unlock the tracker, and bring it to position 200,200. Close to the top left of your screen. It will also leave it unlocked, a message in chat will advise you that it is unlocked. Rememmber, when unlocked you cannot use the mouse functions in the tracker. Please be aware, if you have less quests in the tracker than you have in your journal, then the zones that you do not have quests listed in the tracker will be displayed. For example, if you have 13 quests but only show 9 of them, the tracker will determine which 9 to show. The zones the other 4 quests are in will show in the tracker with no quests listed. This is by design. In a future release I will look at the logic behind how it picks the quest to view, I only know for sure the quest you have focused, and as many of the quests in the zone you are in. Then it seems to be random. -- Fixed Timer causing game to freeze. -- Looking at stopping the timer early instead of it running down on successfully getting out before Overseer shows up. -- Fixed so that Optional Objectives show. ----- Added color choices for Hints and Hidden Hints, including a complete option. -- Ability to for the toggle to turn off all of the above to disable the Settings of each of the above. -- Changed the Quest Time to read "Time:" instead of "Time Remaining:" to allow for more compact designs of the tracker. -- Known bugs, quest sorting not working when using Category view, will work on immediately. Originally it was pointed out to me that some tracker elements were no longer showing, in my testing it had been that way for a while. After fixing the problem, I disovered it made the output of the tracker much longer. There was an options to hide hints, to hide all hints and optional info, and only see optional and hidden information on the focused quest. What I did not have was individual control. As was pointed out to me, the Dark Brotherhoos and the Theives Guild quest lines depend heavily on the Optional Objectives, as it increases the reward, and influences the time allowed. Therefore, I did not want to have the users that would need this feature to have a tracker that looked cluttered if it was not their desire. So I added the addtional toggles, so for example, if you do a lot of DB quests, you could turn off all optional information except the Optional Objectives. Then all you would see is who you need to kill, and what optional objectives you have to complete. However, if you want the hints and optional information you can get them. I know I promised a few people various tweeks, and this started out as fixing an existing problem, which always takes priorty, and expanded into features that would be needed in my opinion. It would be far easier to do it now since a lot of it involved the same code area I was working on. I have tested this version, however it was a major rewrite of how every quest element is handled, so I may have missed something. Please report them either as comment or as a bug immediately. Thanks to all of you that find this tracker useful. Quest Timer for quests that have a completion time is now live. -- Quest timer for the remaining time will be displayed at the top of the tracker. -- Quest timer is only visible during the portions of the quest that the timer applies. ------ Turn the time on or off, if off then if a quest with time comes up it will not display. You will notice space at the top of the tracker where the timer will appear, this space will be either even if you do not have the quest timer on. Due to how the UI window is built, in order to not have the space it would require the quest list to be refreshed about every 10 milliseconds, which is a bit excessive. I needed a fixed position that will not move with every update of the quest tracker as well. If that is a concern, I will look at later on redoing the UI window in the tracker. -- Now compatible with CraftStore Fixed Add On. When crafting enchantments or food, it will recognize the CraftStore Fixed UI windows and hide the tracker just like all of the other crafting windows. -- Now compatible with Bandits UI. When FCM Quest Tracker sees Bandit UI is loaded it will skip the code that was causing issues. Next up for 1.3 is Quest Timer. Please comment or enter bugs in the portal for anything you find. Bugs always take a priority. -- Fixed Show Quests in Current Zone Only when Show Category Zone View is off. -- Fixed error caused by a typo in group quests. Added a requested feature that when using the Category Zone feature (default for tracker), that you can select by quest type for it not to include the zone in title. For example, if you have a dungeon quest in Glenumbra and Bangkorai, currently with default settings you would see the categories "Dungeon - Glenumbra" and "Dungeon - Bangkorai" in the tracker. If in the Settings for Category Zone View for dungeons is set to "Off", now the two dungeons will appear under the "Dungeon" category. 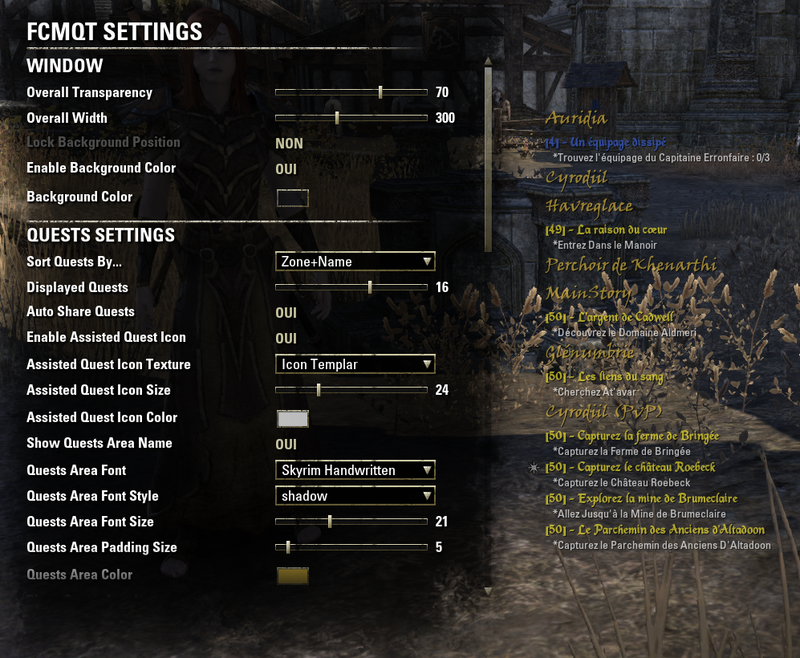 If you have "Show Category Zone View" in the Zones Quest Settings turned off, then these options have no effect. -- Started testing solution for CraftStore when using it for crafting Runes or Food, hopefully solution soon. --Fixed option to hide hidden into and hints. It has been renamed to "Hide Optional/Hidden Quest Infos/Hints"
--Added option to not apply transparancy to quests in the same zone as the focused quest. --See notes in Comments for in depth details. - Fixed a bug that caused quests not to be selected by mouse with a certain options selected. - Still working on full Summerset compatibility. - Fixed issue with Summerset thanks to help from manwoodsal for testing for me. ----- Selecting Zone+Name is the normal sort. - Started rework of Zones in the coding, please provide feedback. - Shows only Zone names, so all guild quests, crafting quests, will show under the zone the quest is in. - Turn off the option "Show Classic FCMQT Zones (Hybrid)"
- Example "Shadow of Sancre Tor (Main Story)" instead of "Shadow of Sancre Tor"
- This does not show when "Show Class FCMQT Zones (Hybrid)" is turned on. - Created new Menu Option, "Show Quest Types"
- If "Show Quests Area Name" is turned off then all options for zone are disabled. - Renamed "Titles" in menu options to "Quest Names", find that more appropriate. Fixed problem with library folder structure, and out of date notifications on them. Added a suggested feature to hide hidden objectives and hints. Added a suggested feature to hide the objectives/hidden info of quests that are not focused. With this option only the quest (and zone if selected) will show in the list, except for the quest that is focused then all of the objectives and hidden info will be displayed. Fixed errors while trying to create color pickers on removed code from last release. Sorry guys. Basically a maintenance release, removed some coding, and some options in the add on menu. Added the Show Quest Timer option, though it has not been implemented. Started working on a testing Quest Timer. * Added option to Show Quest Timer - Does not function yet. * Removed Level option since Tameriel One the quest level is equal to the character level. * Removed sort option "Zone+Level"
As a precaution you may want to back up your savedvars file, however in testing I did not find any problems created by the changes in this update. Holiday events showing properly is tested. French and German language updates to Quest Types is included. 0.91 Fixed problem with 0.90c not loading, and registering as out of date. I have looked... maybe overlooked on how to move the display of quests. I don't really want the display smack dab in the center of my UI. Only alternative I have found is to be able to hide it while in combat. Is there any easy way possible to move it without a reconfig of files? I don't know the proper way to do this but you can type in fcmqt_lock to unlock the window. Then press enter to open the chat box and right click/drag the window where you want it. Type fcmqt_lock to lock the window. Again, this may not be the easiest or proper way to do this but it worked for me. The timer is still not synced properly when doing Thieves' Guild quests. Game says the time is up but the quest tracker is still counting down. i love this addon....now i found another error thats not nice. if you play black sacraments you dont see the alerts and you also dont see the timer. so i need to deactivate the addon and use the original quest tracker that shows this points. i personally dont found any options (maybe i am blind ) to change this. Please, can you add an option to "display the number of open quests in each Category or Zone". Hello, would it be possible to also show the zone/instance icons instead of the text? I hope this question has not already been answered, at least I did not see anything. Last edited by Neverlands : 11/02/18 at 07:05 PM. With the 20 Oct update, anytime I try to put something from my Craft Bag into the Guild Store with Awesome Guild Store, instead, I get the Craft Bag Retrieve Items window! I've spent around 4 hours troubleshooting this issue, and it only happens when FCMQT is active. I am also having the same problems. I have been digging into this for some time, it appears one of the libraries is causing the issue. I had updated libCustomMenu a library I use, to the newest one. When I revert back to a prior version of libCustomMenu then it works AGS works fine. I am posting a update using the older libCustomMenu, however the issue will be is if someone else has an addon with the newer libCustomMenu it will break again. When we use libraries, and as it loads into your computer, even if I install say version 1 for my AddOn, and some other addon uses version 2, then my addon will run version 2 instead of version 1. This way every instance of a library does not take up more memory. Votan the author of libCustomMenu is aware of the issue, I will also make sure Sirinsidiator the author of AGS knows as well. For now you can use the update that should show soon. Wonderful addon!!! One teeny-weeny request though: can you make it so it saves toggle state? I only toggle it when needed and I keep it toggled off most of the time, and currently it it always toggled on when you start the game. I am not sure which toggle you mean, however, I toiled with this decision of saving the toggle state and feedback I got was not have it saved, as players would do a toggle and not want it saved. What I would do, is make the change in the settings for the off state, and then use the toggle to turn it on. For example, if you are switching between Zone View and Category View, and want it primarily be Zone View, set that in the settings. Please let me know if this helps, or which toggle you are referring to so I can better direct you. Oh, I should have written "show" instead of "toggle. :P I mean show/hide FCM. I prefer it to be hidden and shown (using keybinding) only when I need it. And right now it's always visible when I start the game or reload UI. Ah! That is easy enough to do. Most excellent, Magnificent Champion Dev! I love this add on! Thank you so much! I do have a question regarding recent behavior. I'm not 100% sure it's this add on though. When I do the Thieves' Guild timed, daily quests the game says my time is up and I've failed the extra rewards portion of the quest. I'm slow, so whatever. However, the Quest Timer is still counting down, like my time isn't up. This happens every time when I'm spotted or attacked. I'm not so stealthy yet, so whatever. What I can't figure out is why the game says my time is up but the quest tracker is still registering time remaining. I thought I fixed that some time ago, let me look at it. Group quests - can I remove this category? Something happened recently (I think) where some questions started showing up in a category called "Group" instead of their zone. This splits one of the two Summerset dailies into it's own group, which is not helpful (at least to me). Can I turn that off, but keep the category view on, so that I continue to keep Guild and Dungeon as categories? Last edited by scottykyzer : 10/16/18 at 08:39 PM. Re: Re: Probably a silly question! I'm having issues moving the window when I first log in... According to the prompt I should be able to just move it with my mouse but I'm unable to "grab" it to move it. It's definitely not locked as I can see the prompt asking me if I want to lock it or not. Addon looks amazing though! I probably should add this message to the prompt as many people have this issue. You need to go to cursor mode, to do so press the "." period key, you can then navigate the screen with the mouse. Left click and drag the tracker to where ever you want. Then go to Addon Settings, Global settings and lock the position. Aha! Thank you! Adding it probably would help... this seems to be the kind of addon you use when you're new to the game from another mmo (like me haha!) so you wouldn't necessarily know this yet . Although I just got the ingame tip for it last night, coincidentally (still not sure I would have put two and two together though ha).